The audio components of VocabularySpellingCity games help emergent readers make connections between the spoken word and the letters on the page. Our phonics games help students practice important foundational skills, with the added flexibility of using any word list. These phonics activities develop students’ vocabulary and offer practice in word building and word recognition, sound-spelling correspondences, and multisyllabic words. Help your students build their early literacy skills with our Beginning Spelling Curriculum, Word Families and Sight Words lists. The Common Core State Standards require students to master different types of writing as well as editing and revising. VocabularySpellingCity’s writing activities can help students practice and improve their writing skills. Instructions may be customized by the teacher to correspond to the standard being taught. Writing practice activities may be printed or submitted electronically to the teacher for review. 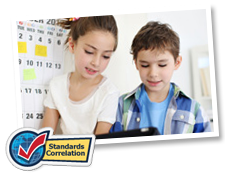 The Language section of the Common Core State Standards includes many of the vocabulary, grammar, and usage standards students are expected to learn. The standards do not specify which vocabulary words students must learn, but they do list the language skills that students should master in each grade. VocabularySpellingCity offers activities and word lists to help students learn the skills covered in this category. VocabularySpellingCity activities and games may be used with word lists for any subject. Use our Math, Science, and Social Studies vocabulary lists to boost subject-related vocabulary. The lists are sorted by topic and grade level for your convenience. You can also create your own lists to reflect your classroom or state curriculum, including higher level subjects like AP Psychology or AP Economics.